The Android mobile app and service is letting kids of all ages check on what Old Saint Nick is up to. Christmas is creeping up fast and as Santa and his elves make last minute preparations, Google Assistant is allowing kids to check up on jolly old Saint Nick. The popular Santa Tracker has been worked into the artificial intelligence-powered digital personal assistant app. 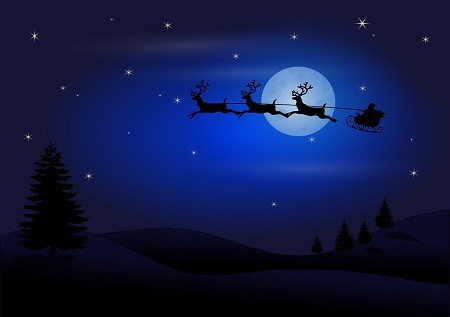 Kids of all ages can now say “Track Santa” or ask “Where is Santa” and find out the latest about Father Christmas. At the moment, the Assistant is providing text answers to the question, though full maps are available. For instance, when using the mobile app or desktop site instead of Google Assistant, a full map response is provided to the inquiry about Santa’s location. That said, the Assistant has a few additional lighthearted options, such as a number of different Santa-themed jokes. The majority of the responses currently shared about Santa’s location have to do with the last minute preparations he is making with his elves. For instance, one reply from the Santa Tracker indicates that he just finished checking the weather reports for Christmas Eve. The Google Assistant app is available for mobile devices based on the Android operating system. Typically, the Assistant helps mobile device users to be able to conduct internet searches, to look through their pictures or complete a range of other basic tasks. However, for the holiday season, Google’s Santa tracking system has been integrated into the Assistant to allow users to find out when he might be flying near to their location. That said, the holiday features aren’t just exclusive to people who celebrate Christmas during the holiday season. Google has also worked in a cute option meant for Jewish kids who are getting ready to celebrate Hanukkah, too. For instance, if you ask the Assistant to “spin the dreidel,” it provides a digital simulation of the spinning four-sided top. This can allow kids to play regardless of whether they happen to have an actual dreidel handy. For mobile device users who have gadgets based on an operating system other than Android, the features Android users are enjoying with Google Assistant are still available. Google’s full Santa-tracking website is available for all smartphones, tablets and laptop/desktop users to be able to keep up with the very latest with the Jolly Old Elf.